More Tips on Tomato - growing in Patio Planters. Tomatoes are one of the most rewarding things to grow, because they taste SO delicious when freshly picked - Some say you'll never eat a supermarket tomato again. 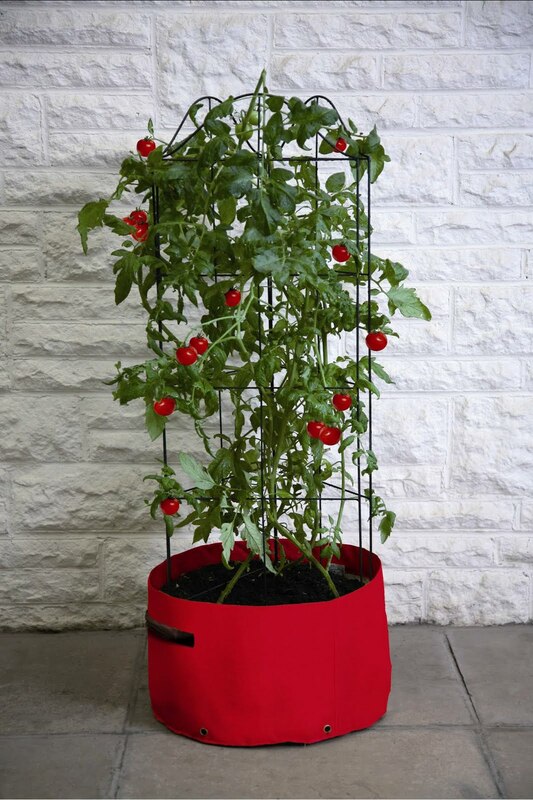 Using patio planters makes growing your own tomatoes easier than ever - You can choose between the Climbing Tomato Patio Planter, which has a three sided metal climbing frame, or the Bush and Trailing Tomato Patio Planter, designed for tomatoes that are happy growing without a climbing frame. If you're using a planter without a frame to grow climbing tomatoes, you'll need to provide some kind of support - 2 or three ordinary garden canes should be adequate, then use some of our Soft-tie to gently tie the plants to the canes as they grow (it's a good idea to leave space for the stems to grow when you tie around them). If you plan to grow from seed we recommend rootrainers for the best start, or you can buy some small plants from your local garden centre who will be able to help you choose the right sort of tomato. Two tomato plants should be enough to fill a Tomato Planter. The planters have drainage holes in the bottom, but for tomatoes we recommend adding a thin layer of gravel/stones at the bottom of the planter to assist with drainage. Then fill with a good-quality multi-purpose compost to about 4cm from the top of the planter. Water the plants and allow to drain before planting them - also water after planting, but be careful not to soak the compost. Do not place tomatoes outside until after the last frosts - Keep them in a light sunny position. As the plant grows, side-shoots must be removed (just pinch them off with your fingers) - Otherwise you'll end up with lots of foliage, and not much fruit - side-shoots grow from the joint between the main stem and the leaf branches. Lower leaves should be removed if they start yellowing, to reduce the chance of infection. Frequent watering is vital but we have to add dry periods lead to splitting tomatoes. You can also just rub off Aphids with your fingers, or spray them off with water. Finally you will have a better crop if you feed your planter regularly from mid-summer onwards, with a good liquid feed (many are available in your garden centre).As soon as the fruit is ripe, pick and eat! - This is a) delicious, and b) encourages more fruit to grow. Best of luck with it. This entry was posted in Grandpa Haxnicks and tagged Tomato (bush and trailing) Patio Planters, Tomato (climbing) Patio Planter, Children's Vegetable Patio Planters on 6th April, 2010 by Haxnicks. The snow is fresh and the climate unseasonally cold. We should be promoting Frost protection and ideas to keep your plants and seedlings warm... But let's look at a more cheery topic. The tomato is a delicate or tender perennial which is grown as an annual and when raised in your greenhouse is very successful. One of the best reasons for growing your own tomatoes is that you can be sure that they are chemical spray free as well as the fact that a greenhouse tomato tastes far better than any supermarket product, firstly because it is picked and eaten immediately while it is warm (refrigerated tomatoes become bland in taste and secondly the flavour is better because it does not have to travel – something a tomato does not like. There are over 3 000 tomato varieties to choose from and you should ensure that you grow several different varieties which will not only add interest but also ensure against an inferior crop from one variety. I have listed a few that you might like to try - “Gardener’s Delight” is probably the best variety for flavour, yield, early results and easy growing. One of the best cherry varieties is “Sweet 100” and if you want a small yellow tomato then go for “Sunbelle”. “Shirley” is a good red normal size tomato variety which is disease resistant and “Big Boy” is a large red, beefsteak tomato with very few seeds which is ideal for cooking. “Brandy Wine”, another beefsteak variety has an amazing flavour. Tomato plants can be bought at garden centres but many people prefer the satisfaction and taste that you get with growing your own. Plants that have been on display for any length of time become affected by too much heat and little or no light. It is much more rewarding to raise your own from seed. Remember that if you are going to raise 3 or 4 different varieties deep modular, hinged opening cell trays like Rootrainers are extremely useful as they are both space and time saving. Tomato seed is sown in a propagator and a temperature of 60°- 65°F is needed for successful germination. If you have a heated greenhouse seed can be sown in late December for planting out in late February or early March for a May/June crop. Most gardeners only have cold houses and then seed should be sown in a propagator in early March and planted out late April for a July crop. There is no need to prick out plants until you are ready to plant them in their fruiting positions. We offer two types of Patio Planters especially designed for Tomatoes and also offer a Cane Support Planter - New in 2010. Soft-tie is the ultimate garden tie for delicate plants like Tomatoes and can be reused again and again. Feed once a week with a weak solution of liquid feed. You stand a better chance keeping Tomatoes in a Greenhouse or why not make use of the New Haxnicks Grower System a Garden Tunnel designed for taller plants. Pick your Tomatoes when they are just turning red and as a tip if it appears that your tomatoes are never going to ripen, pick them and place them in a dark place with a single red tomato. The other will soon get the message. This entry was posted in Grandpa Haxnicks and tagged Tomato (bush and trailing) Patio Planters, Tomato (climbing) Patio Planter, Original Soft-Tie, Grower Poly Cover, Rapid (Shrub) Rootrainers on 13th January, 2010 by Haxnicks. Some of Britain’s most popular home-grown vegetables – peas, beans, tomatoes – need more upward growing space, which is not always easy to accommodate on patios and balconies. Help is at hand, Haxnicks is extending its best-selling Patio Planter™ range with the addition of a green Pea & Bean Patio Planter (RRP £19.99) that comes with a six- foot tall adjustable tubular-steel growing frame; and a red Climbing Tomato Patio Planter (RRP £19.99) complete with a three-sided, metal climbing support frame. 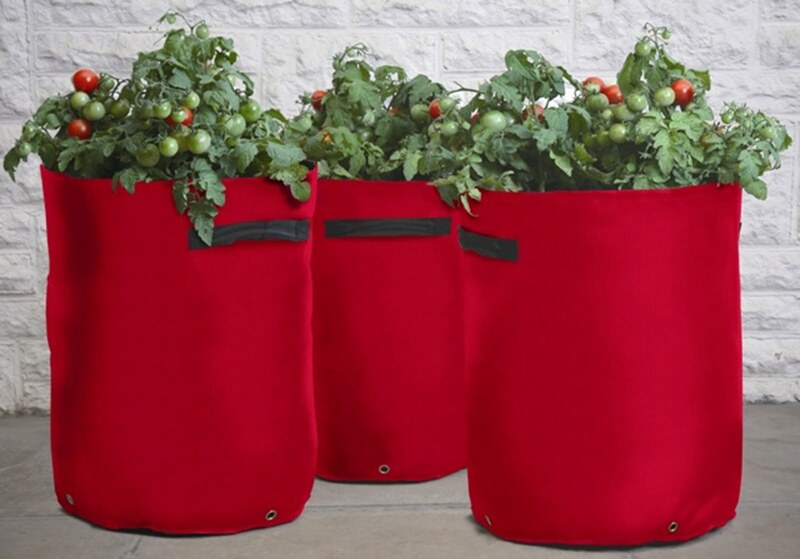 Haxnicks have also launched an alternative tomato planter, the Tomato (Bush & Trailing) Patio Planters (RRP £14.99). A pack of three 45cm-high red planters which provide the extra height needed to accommodate bush and trailing varieties. The robust planters are made from woven polyethylene and come with sturdy handles on each side. To ensure the best possible drainage, they have reinforced drainage holes in and around the sides of the base. They are ideal for small gardens, patios and balconies and, unlike most large planters, fold away flat for easy storage. The reusable planters make a great value alternative to regular containers and provide the space-efficient option when space is at a premium. New Haxnicks Patio Planters™ are available now from all good garden centres. For more information, call Haxnicks on 0845 241 1555. This entry was posted in Grandpa Haxnicks and tagged Tomato (bush and trailing) Patio Planters, Tomato (climbing) Patio Planter, Pea and Bean Patio Planter on 11th March, 2009 by Haxnicks.